Mini Terra Cotta Pots - Measuring approx. 1 and 1/2 inch diameter across top of pot. Medium Brown: 2 1/2" and 2" Heart shapes, and all 2" long ovals. Light Brown: 1 1/2" and 1" Heart shapes. Red, Pink and Purple: Tulip shapes. Pink: In 2 of the long ovals paint a pink oval 1/8" from edge for the bunny ears and in a triangle shape at the point on the 1" heart. Coat all pieces with gloss varnish. Glue light brown hearts onto medium brown hearts with tacky glue with placement shown in photo. Let dry. Wind a piece of the medium wire around a pencil once or twice, slide off pencil. Bend the ends on each side of the curl so they point straight north and south. Repeat these steps so that you have four of these wire curls. Turn over the large oval shapes that are to be the ears, lay one straight end of a wire curl on the end of the ear piece and cover the wire end in hot glue with your glue gun. Hold in place until set. Now turn over the bunny head, take one of the bunny ears and lay the other end of the wire curl in place on the bunny head and cover the wire with hot glue. Hold in place until set. Repeat for the other ear. Follow the same instructions to attach the arms on the back of the body. Take another piece of wire that is 2 inches long and bend it in half to form an A frame shape. Lay the bunny body and head right sides down and in a finished position. Lay the A shape wire so the bend is on the back of the head and the ends are on the back of the body. Cover the wire with hot glue wherever it lays on the wood pieces. Hold in place until set. After the glue is cool and dry, cut six, 1" pieces of wire and glue them on the face of the bunny just under the nose with tacky glue for the whiskers. Let dry. Cut 6 pieces of light green chenille that measure 1 1/2 to 2 inches long. Place a 1/4 line of hot glue on the wrong side of the flower base. Lay the end of the chenille in the glue and hold until set. Repeat for the remaining 5 flowers. To make the dirt for the pots, cut a piece of brown fabric to be about 2 x 2 inches and turn so that wrong side is up. Put a small piece of polyfil or stuffing in the center of the fabric. Pull all edges of the fabric around the stuffing and place it, raw edges down, into one of the mini pots. Adjust for smooth look on top. Secure the fabric to the inside of the pot with hot glue if desired. Cut or pierce three, evenly spaced, tiny holes through the fabric. Push the ends of the flower stems through the holes as far as they will go. Using your hot glue gun, glue the picket fence to the back piece of wood. Next, glue the finished bunny against the picket fence. Set your glass votive candle cup in the center of the wood base in front of the bunny to see where your pots should be placed. Glue the flower pots on either side of the bunny and back far enough from the top of the votive cup so they will not be near the candle flame. Glue additional small rocks around as desired. 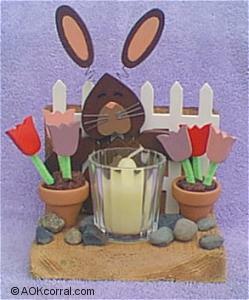 Fun decorative candle holder for the Spring and Easter Seasons.